I first heard about the offering in Jan 2014 when it was advertised as the cheapest gigabit fibre plan in Singapore. At $49.99 it truly was a shock to the system for the incumbent ISPs who at the time either didn't have anything to compete with or had gigabit plans going for as high as $399. It was a crazy time, I remember immediately calling up and reserving a spot despite the fact that my current cable internet plan was still barely a year into a two year contract. At the price, it didn't matter, I knew I had to have it. What followed next wasn't exactly what I had hoped for. Now my area had just been recently activated for fibre services through Singapore's National Broadband Network but I had to wait for MyRepublic to physically come down and activate the fibre point which from my understanding had to be properly configured to deliver the gigabit connection, because at this time most fibre points didn't deliver such speeds. I was content to wait a couple of months, and they have told me that the soonest would have to be March before they could come down due to extremely high demand. After 2 months of waiting, I was told to wait longer, several phone calls and emails to follow up yielded the same answer and to cut this short and to spare me from re-living that long wait, it wasn't until the first day of June when I finally got my service activated. Was it worth the wait? Put it this way, at this price point, for this speed, I'll be honest I would've had to be waiting a lot longer before MyRepublic came around to disrupt the ISP market in Singapore. Was I disappointed that I had to wait this long for MyRepublic to activate the service? Sure, I mean there were hundreds of people posting in the Hardware Zone fibre subforum complaining about the long wait, but that wasn't going to deter me from attempting to max out my connection and do all the nerdy things I could with the connection. It was time to get stuck in. In this review I'm going to cover some key questions gamers or tech enthusiasts in Singapore I think would want to know in looking for a gigabit fibre service and what the MyRepublic experience has been for me since June 2014. What does it mean to have gigabit fibre? Do I really need it? What can I do to maximise it? Is it great for gaming, downloading and streaming, what is the overall experience like? In this review I intend to cover those burning questions. When it comes to pings to local Singapore servers there are obviously no complaints with low and LAN like performance with single digit latency. For the rest of the region, the pings to are sub 50-100 for Hong Kong, Philippines, China, South Korea and Japan. Latency is a no brainer for local Singapore and regional servers as expected, and having done the research it seems to be quite consistent across the other ISPs as well. In terms of international pings in the US or Europe, they were slightly lower compared to what I was used to with cable and DSL connections. The lowest I would get in West Coast US servers for games like Diablo 3, War Thunder and Knights of the Old Republic would be around 180 and peak at about 220 or sometimes higher. All this is within reason and the best we could hope for being so far away. Once in a while I'd join European servers just to see what it was like and would get around 250-280 to the UK, again not too bad considering we're tens of thousands of kilometers away. On paper, the plan is 1000Mbps download and 500Mbps upload. In terms of download speeds, to be honest I have yet to actually max out the gigabit connection in real world downloads. I don't think this is necessarily the ISP's limitation because I've done speed tests and it shows my connection maxing out. On average I'd say I get around 400-600Mbps either on torrents or on other high speed servers like Steam and Origin. When it comes to uploading, again it doesn't necessarily max out unless I'm doing a speed test but on Google Drive where I upload the occasional file, be it large amounts of videos or photos, performance is practically instantaneous and I don't have to wait. Gigabit internet spoils you guys, I'm warning you. Nothing bad I can say here, I just hope the rest of the internet content providers and servers can catch up and put gigabit plans to their paces. I'm looking at you Netflix and 4K streaming. When it comes to mainstream services like Netflix and YouTube, performance is stellar, I can't complain. Both load practically instantly and stream without ever really buffering. Now I must qualify for Netflix, I actually use either a VPN or most recently when the service was announced as free for all subscribers (previously $5 monthly) a DNS service called Teleport from MyRepublic (service discontinued in 2016). Watching live streams on Twitch was very problematic when I started using it heavily late last year from September up to December where I and many watchers on MyRepublic couldn't seem to get a decent HD or Source stream. We were usually left with is a stuttery mess. As of the writing of this review, things have improved a little, I’ve noticed it doesn’t buffer as much on most streams but still seems to happen from time to time on some live events and competitions. There's a thread that has been discussing the issue in the local Hardware Zone forums and I've actually been actively posting my experiences in dealing with Tech Support in those forums. So why is this happening? How come a gigabit fibre plan can't seem to keep up with live streaming, I mean sure with all the bandwidth this situation should be a cakewalk right? Well that was certainly my expectation but real world results were different. I did some digging and talked to the helpful and passionate folks in the Fibre subforum of HardwareZone and found out that all of this seems to be related to the fact that MyRepublic buys its bandwidth from a Content Delivery Network (CDN) called Level3 which is known to have issues with Twitch streaming connections. I'm aware that all sorts of information circulate on the internet so it's hard to confirm anything for sure and I've actually reached out to MyRepublic support on the issue and explaining that I've gathered some open source information to support these claims as discussed in the HardwareZone Twitch thread. To be fair and give credit to the MyRepublic team, things have improved since last year and I hope that they keep working to improve the network connectivity over time. Aside from Twitch, I've also been experimenting with other live streaming services such as NTV.mx which lets you stream hard to find sports channels and other such channels from around the globe. Now I'm a cordcutter and haven't had a cable subscription since 2008 so when I want to watch live football, I have to deal with live streaming online. Unfortunately at this stage I still struggle to find a reliable service because the same issues I described above with Twitch plague my live stream experiences. The only solution for the streaming issues I find are to have my VPN turned on, which somehow reroutes my connection and lets me enjoy a semi-stable live stream experience, although it does still stutter occasionally. It's not ideal but it does work as the only stop-gap for me when I find I need to watch something live. 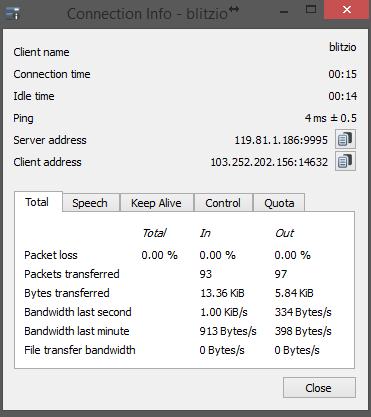 However, the moment I turn off my VPN, the issues are very apparent and I'm stuck with a stuttery mess which to be honest can be rage inducing everytime I think about the fact that I'm on gigabit fibre. From an operational standpoint, technical support seems to be quite competent in terms of calling in to ask for help or even via email or live chat. The live chat option is extremely convenient and at times find it very easy to quickly drop a message and expect an email back within a day. I haven't had any major service outages or breaking issues in the past 9 months so I haven't had anything to call in or email for in terms of urgent matters so can't provide any insight on that. However mentioned earlier in the review, I did in fact get in touch with Tech Support on the Twitch streaming issue. 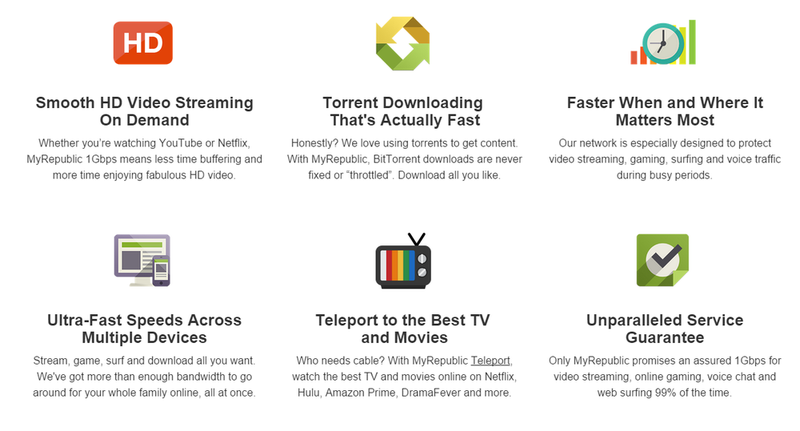 Having consumer MyRepublic gigabit fibre in Singapore means you can effectively run torrents, downloads and streams (YouTube, Netflix) in as many computers and devices in your home all day long without really hitting any limits or slowdowns. My gaming experience was spot on and exactly what I'd expect it to be in terms of pings and stability. Downloading and uploading massive files are inconsequential in these speeds, we're talking an average of 400-600Mbps and I'm assuming that's only because of the server bandwidth limitations I'm downloading off and even hard drive transfer limitations. It's a great feeling indeed to know that you can share your connection with as many people or devices in your household, but bear in mind there are limitations in live streams as I mentioned. In the context of live streaming, MyRepublic leaves a lot to be desired especially when you're subscribed to gigabit fibre, I mean videos really have no right to be buffering in HD. If you're someone who needs the basics of gaming and download consistency, MyRepublic should suit your needs perfectly, but if you're like me who belong to a niche that requires a consistent live streaming experience in HD, then things get tricky and I will caution you with what I've experienced so far and outlined in this review. At this rate, with prices plummeting and the average well below $100 a month for gigabit fibre to the home, I would advise consumers to definitely make the switch once those legacy broadband plans expire, it's time to move well into the 21st century and with around 99% of the entire island now covered by the National Broadband Network, yes you need it, but should it be MyRepublic?